Audible.com overhauled its iOS app on Wednesday morning, bring a native iPad interface to the previously iPhone-only offering. Audible.com now is native to the iPad, and can hide your already-finished books from view. Version 2.0 of the audiobook-playing app also features other upgrades, including revamped navigation that the company says makes it easier to control navigation of a book while the user is on the go. Three big buttons now dominate the navigation within a book: a 30-second rewind button, in case you temporarily lose track of the narrative; a play button; and a bookmark button for finding your way back to your location in the book. If you want to do more substantial fast-forwards or rewinds, you can use the slider button at the top of the page to quickly pick your new location quickly. It's been more than two years since I reviewed Audible's first-generation iPhone app, and the company has impressed since then with its responsiveness to customer wishes and critiques. In response to such critiques, for example, Audible added a link to its store in one of its first updates; unfortunately, that later disappeared, due to Apple's rules for in-app purchases. But in the meantime the company has also added cloud-based features—letting you start a book on one device and finish it on another—and created the very useful Whispersync feature, which lets users jump between reading a book on Kindle and listening on an iPhone. 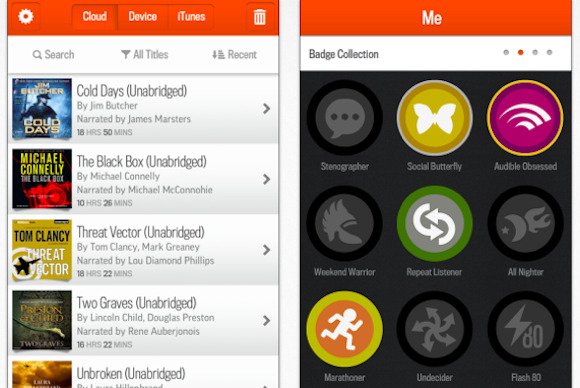 Audible.com’s iOS app is free and compatible with devices running iOS 5.0 or later. Audible.com members pay $15 a month—new members pay half that price for their first three months, as well as getting one complimentary audiobook title for each of those months.